Yitshak Frenkel-Frenel was born in Odessa, Russia (now Ukraine) in 1899, the great-grandson of Rabbi Levi Itzack of Berdichev. In 1917, he studied under Aleksandra Ekster at the Art Academy of Odessa. He emigrated to Mandate Palestine in 1919 as part of the first wave of settlers of the Third Aliyah. In 1920, he established an artists' cooperative in Jaffa and an artists' studio in Herzliya and participated in the first art exhibition in Israel. Later that year he travelled to Paris, where he studied at the École des Beaux-Arts and the Académie de la Grande Chaumière, as well as sculpture at the studios of Antoine Bourdelle, and painting under Henri Matisse. Frenkel-Frenel exhibited his work at the Salon des Indépendants and regularly frequented the café Le Dome at Montparnasse. He returned to Palestine in 1925 and opened the Masad and Eged studios of art and established and directed the painting studio of the Histradut School in Tel Aviv. His students included Shimshon Holzman, Mordechai Levanon, David Hendler, Joseph Kossonogi, and Ziona Tajar. He was also a mentor to Bezalel Academy of Art and Design students Avigdor Stematsky, Yehezkel Streichman, Moshe Castel, and Arieh Aroch. Frenkel-Frenel made Safed his home in 1934, and was one of the founders of the Artists' Colony there in 1949. In 1973, a museum of his work was opened at his house. In 1979, he had a solo exhibition at the Musée de l'Orangerie in Paris. He died in Tel Aviv in 1981 and was buried in Safed. Frenkel-Frenel's paintings revealed the abstract, cubist influences he adopted during his years in Paris, rather than the orientalist trends then popular in Israel. 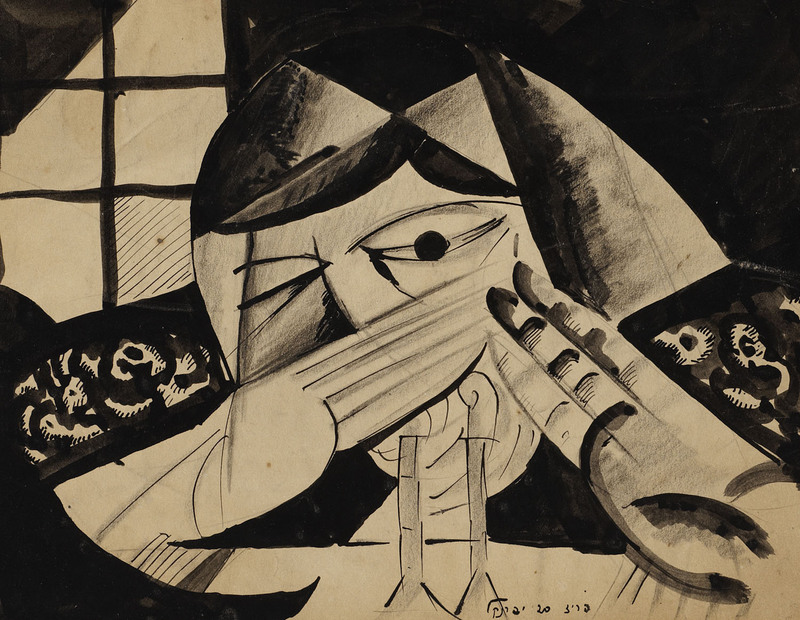 In Shabbat Blessing and two related studies in the Ben Uri Collection, both entitled Man with Torah, all executed in Paris, Frenkel-Frenel reinterprets traditional Jewish subject matter with warmth and even humour, adopting a short-lived Cubist manner.